Explanation: Bright nebulae abound in and around the expansive southern constellation of Centaurus. This one, cataloged as IC 2948 is near the star Lambda Centauri and not far on the sky from the better known Eta Carinae Nebula. Embedded in the reddish glowing cloud of hydrogen gas, typical of emission nebulae found in massive star-forming regions, is the energetic young star cluster IC 2944. Seen in silhouette near the top of the view are small, dark clouds of obscuring cosmic dust. Called Thackeray's Globules for their discoverer, they are potential sites for the formation of new stars, but are likely being eroded by the intense radiation from the nearby young stars. 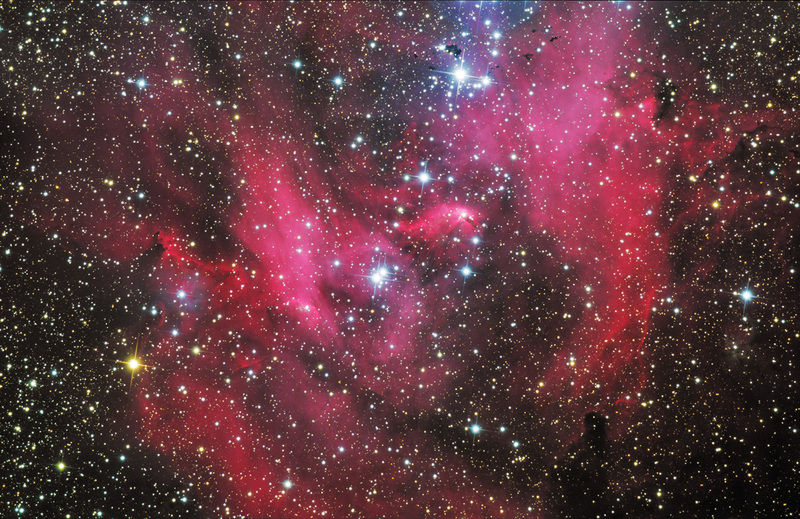 Of course, gazing at the center of the region suggests to some IC 2948's popular name - The Running Chicken Nebula. The gorgeous skyscape spans about 70 light-years at the nebula's estimated 6,000 light-year distance.